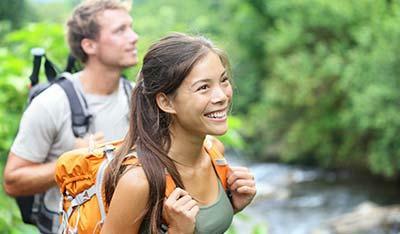 Browse our Favourite Tours and Transfers below. The experience of sailing on this beautiful and rare classic Australian yacht gives as much to the day as the the destination. Become involved as much or as little as you like, help set sails, take a turn on the helm or lean back and relax with your favourite book, listen to music or simply daydream and be beguiled at the uninterrupted beauty of the Whitsunday Islands. 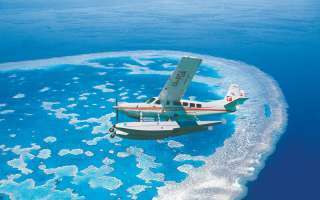 Air Whitsunday has evolved since its conception back in 1973 - with the energy and enthusiasm generated by Kevin and Sue Bowe – to provide an unsurpassed seaplane service to the region. We have built upon our very beginning`s – still with the same intention - of providing you the opportunity to glimpse the enormity of the Great Barrier Reef; stretching over a curved horizon; to the glistening white silica sands of the famous Whitehaven Beach - all from the ultimate perspective of seaplane comfort. Over the history of our 37 years trading we have been a growing, changing entity with a focus that has remained steadfast in providing specifically tailored scenic flights and Reef experience tours that take full advantage of this stunning area. The discovery of “Heart Reef” in 1975 (now a Whitsunday feature of the international tourism market) by one of Air Whitsunday`s very own pilots has provided a focal point to our popular scenic flights and showcases the diversity of the Great Barrier Reef. Aptly the Heart Reef is a favourite for brochure shots and other colour promotional material for the Whitsundays. What makes your seaplane experience with us so unique is the ability to provide – YOU – our guest, with some of the most breathtaking and memorable visuals provided by ‘Mother Nature’ from a bird`s eye perspective. The Great Barrier Reef is truly one of the amazing wonders of the natural world and a 'must-see' for any visitor to Australia. Cruise Whitsundays offer two fantastic reef experiences: a full day experience or an overnight adventure! Experience the extraordinary beauty of Whitehaven Beach on a day cruise with Cruise Whitsundays. We offer a range of Half Day and Full Day excursions to both Hill Inlet and the main beach. An unforgettable stunner of a day! 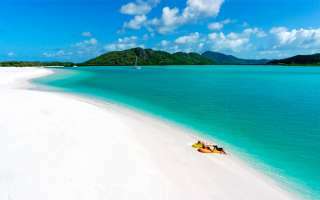 Every visitor to the Whitsundays simply must step ashore at one of the area's 74 sub-tropical islands. Cruise Whitsundays offer a number of day cruises to fun-filled, family-friendly Daydream Island & the famous island that really does have it all: Hamilton. This is exhilaration and relaxation rolled into one! This full day sailing adventure visits famous Whitehaven Beach and is all about jamming as much fun as possible into the day with swimming, snorkelling, sunbathing and, of course, speedy sailing! 'Camira' is a world first with her sleek lines, spacious deck areas and breathtaking performance. 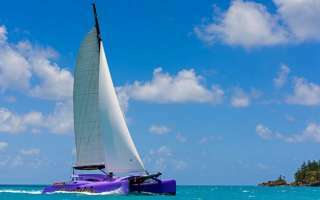 Camira is one of the world's fastest commercial sailing catamarans, capable of sailing at speeds up to 30 knots! All in a day.....visit magnificent Whitehaven Beach, see Hill Inlets swirling sands and enjoy an Island Reef Snorkel at one of the many pristine coral reefs around the Whitsunday`s onboard FURY - the `Ferrari` of day boats in the Whitsundays! Multi award winning Ocean Rafting visits the “Wild Side” of the Whitsunday Islands, the uninhabited islands with beautiful natural scenery brimming with marine, bird and animal life. There are two exciting tour options, the Northern Exposure and Southern Lights. 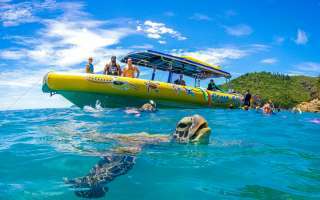 Each Ocean Rafting day offers three days in one, including an exhilarating ride to Whitehaven Beach, pristine snorkelling reefs and guided Whitsunday Island National Parks walks. Ocean Rafting is the only tour to have direct access to the stunning and iconic Hill Inlet beach, and special snorkel sites at Hook Island and Border Island ensure a memorable underwater experience. The semi rigid inflatable vessels are super fast allowing guests to experience a fun ride, adventure and education amongst the natural beauty of the Whitsundays. 28 - 32 passengers at most allows for personal snorkelling lessons and the pleasure of a small group. An optional buffet style lunch is served at the beach with plenty of time to swim in the turquoise ocean or just relax on the silica white sand. Ocean Rafting has been operating since 1997 and is proud to have special permits allowing its vessels to visit protected areas in the Great Barrier Reef Marine Park. 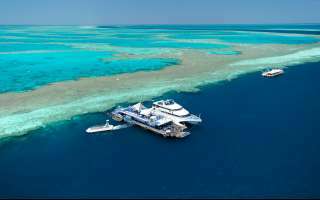 The Skipper and Eco Host will ensure guests have a fun filled adventure and personalised service with snorkel lessons and a guided National Park walk in the Whitsunday Islands. 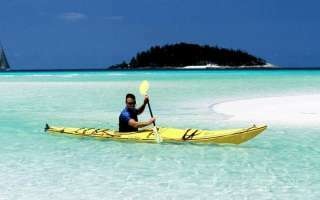 Based in the spectacular Whitsunday Islands, Salty Dog Sea Kayaking has been running kayaking expeditions since 1996. Its qualified staff have an intimate knowledge of this region and enjoy nothing better than sharing this with friends and guests. Comprising more than 70 islands, the Whitsunday Island Group is the largest offshore island chain on the east coast of Australia. And as part of the Great Barrier Reef Marine Park, its tropical, clear,warm waters offer some of the most breathtaking and accessible paddling in the world. Join us for an unforgettable experience on one of our fully-guided trips or extended expeditions. Choose a tour from our schedule or let us customise one to suit you or your group's special requirements. Alternatively, explore the islands at your own pace with a "freedom" rental kayak, camping out under the stars or "living in up" at luxury resort-style accommodation en-route. 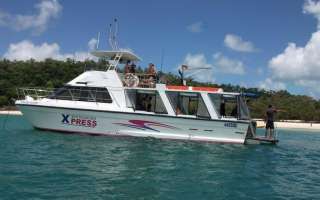 Whitehaven Xpress is a cruise with a difference,it is family operated with Terry,Dan &Jill providing a unique personal service for visitors to the Whitsunday Islands,with three relaxing destinations. Just a short walk to the Hill Inlet Scenic Lookout for outstanding views of the inlet and Whitehaven Beach...be sure to take your camera. We give you the most time to swim,walk or relax on fabulous Whitehaven Beach and under the shade of the trees enjoy our gourmet beach BBQ,which is cooked personally by Dan who is the skipper turned chef.Look out for the interesting native wildlife! Swim or snorkel over spectacular coral and tropical fish.We have snorkelling tuition for the inexperienced.If you don't want to get wet be sure to try our glass bottom boat,our guide will show you the mystical underwater world of abundant marine life. On our homeward journey a platter of cheese and biscuits is served.On arrival at Abel Point Marina our courtesy bus returns you to your accommodation. 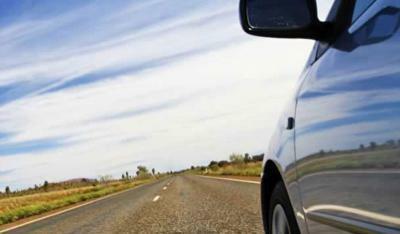 Airlie Beach Transfers and Tours offer a range of services for guests visiting the Whitsundays. 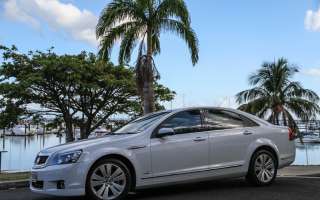 Options include Whitsunday Coast Airport shuttle and private transfers, day and sunset tours to Hydeaway Bay, as well as private charter and limousines services around Airlie Beach. What a way to start your holiday! 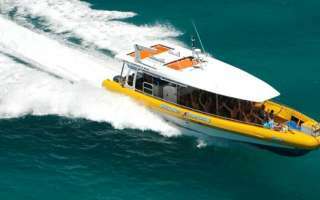 Cruise Whitsundays provides the most extensive island resort transfer service in the Whitsundays offering seamless, hassle free and fast transfers for arriving and departing guests. 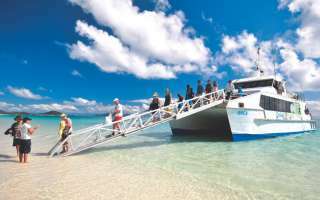 Cruise Whitsundays island resort transfer service connects Great Barrier Reef Airport at Hamilton Island to Daydream Island Resort and Spa, and Airlie Beach. 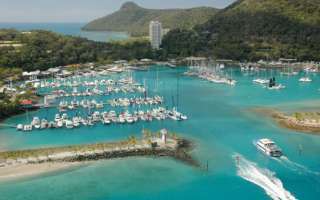 It also connects Whitsunday Coast Airport at Proserpine through to Daydream Island and Hamilton Island, as well as providing a service between the islands and the mainland. We have a fleet of modern, purpose built vessels, decked with comforts including air conditioning, plasma screens to provide information on the resorts and area, a bar serving REAL coffee and a full range of drinks and snacks. Hmmm… decisions, do you have a cappuccino or wine? 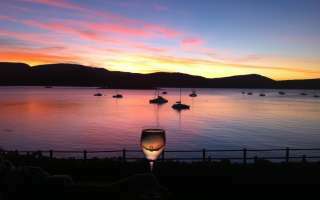 Sundowner Cruises operates from Airlie Beach, where the Whitsunday islands provide the perfect back drop for our sunset cruises and variety of other cruises Sundowner has to offer including private charters for birthdays, corporate groups, weddings or any celebration. Why choose us? We have been happily operating in Airlie Beach since 2006, we love what we do and being a purpose built catamaran we are able to circumnavigate Pioneer Bay from Mandalay Point to Cannonvale Beach and with very little draft we are able to get up close and personal to the many points of interest, including the ship wreck at Cannonvale Beach and a bit of Turtle spotting with in Turtle Bay. We are fully covered from the elements and with a flat surface and no trip hazards like that of a yacht, you have room to move and high heels are welcome. Our philosophy at Sundowner is about providing a great product, fantastic service in a friendly social atmosphere that gets your holiday of to a great start and that allows you to truly unwind and bask in a fantastic Whitsunday sunset whilst enjoying your favorite tipple from our fully licensed bar. Sundowner departs from the new Port of Airlie which is only a short 200m walk from the main street of Airlie Beach. Hydeaway Bay has so much to offer visitors to the Whitsundays...stroll along the picturesque remote beach, swim in crystal clear waters, treat yourself to a relaxing massage or watch the sun set over the Whitsunday waters. Airlie Beach Transfers and Tours offer exclusive day and sunset tour to Hydeaway Bay and Cape Gloucester, with a choice of lunch or sunset dinner at one of three beachfront restaurants... Montes Reef Resort, Cape Gloucester Beach Resort or Dingo Beach Hotel. The Hydeaway Bay day tour is also ideal for visitors departing on the Virgin afternoon flight from Proserpine. 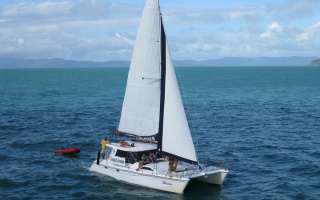 Illusions is a comfortable 12 metre catamaran sailing daily from Abel Point Marina at Airlie Beach to the beautiful fringing reefs of the Whitsundays at Blue Pearl Bay on Hayman Island, and to Langford Island & Reef, part of the Great Barrier Reef Marine Park. 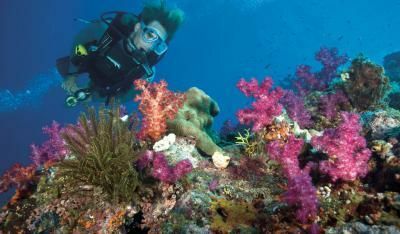 Cruise, snorkel, scuba dive, boom-net, swim with the fish while they are being fed, or simply relax and enjoy the scenery. On Illusions, the choice is yours. Illusions is fully licensed for your convenience, with wine, beer and spirits available at very reasonable prices. A magnificent buffet lunch, snorkeling and diving equipment all included. We are a sailing vessel designed for relaxation without crowds, which allows you to appreciate the picturesque scenery and spot dolphins, turtles and whales in the whale season. Whitsunday Crocodile Safari is a family owned, professionally operated, fully-guided and safe day-trip nature excursion into the estuaries and wetlands of the Whitsundays. This unique tropical environment, is home to many species of native and migratory birds, mammals, reptiles and marine animals, including approximately 150 estuarine crocodiles. The tour commenced operation in 2000 and you are guaranteed excellent customer service and a memorable nature experience. Whitsunday Crocodile Safari holds advanced eco-certification with Ecotourism Australia and is a Green Travel Leader. 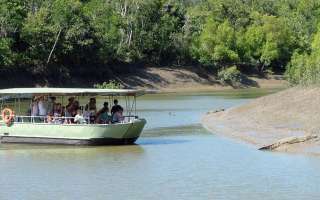 The tour operates on private land, and is the only commercial tour on Proserpine River. The safari is set to the background sounds of nature and gives you a feeling of being miles from civilization, deep in the Australian bush, even though you are only five minutes from Proserpine and 30 minutes from Airlie Beach. Multi award winning Whitsunday Jetski Tours offers exciting adventure tours in the Whitsundays and is the first and only guided jetski tour operating from Abell Point Marina, Airlie Beach to the Whitsunday Islands. Guests can ride the latest model jetski into the beautiful world heritage Whitsunday Island Marine Park. 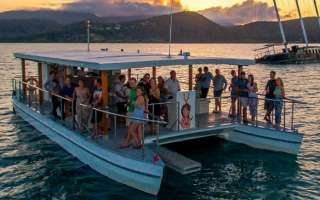 Two tours operate daily, the ‘Airlie Adventure’, also known as the ‘Turtle Tour’ with sea turtle encounters on nearly every trip and the ‘Two Island Safari’, a jetski adventure incorporating the waterways of South Molle and Daydream Islands. Guests have the option of a soft adventure tour around Pioneer Bay or the thrill of jet skiing across to Daydream, South Molle and the surrounding islands, allowing for tours to operate in most weather conditions. The Jetski to Paradise tour will satisfy your thirst for adventure jetskiing as you travel to the mainland resort of Paradise Cove. Looking for a little more adventure? Experience the ultimate in fun with the Ultimate Island Trek, incorporating an epic solo adventure to Palm Bay resort for lunch before the ultimate 70km return trek.